For many Sheikh Hasina is much more than the Bangladesh Prime Minister or a great world leader. For many she remains their greatest strength and they know Bangabandhu Sheikh Mujibur Rahman’s worthy daughter is always with them – not always physically, but in spirit and especially in times of need. Jahirul Islam Himel, former Vice-President of Chandpur Polytechnic Institute in Chandpur district’s Bangladesh Chhatra League (BCL), the student wing of the ruling Awami League, has been sick with a rare disease that has almost crippled him and his efforts to go to the United States have failed so far. It was sometime in 2018 that I met Jahirul, 27, when he came to my former office to meet a colleague. His first sight pained me. Smiling but for any sane persons it was clear he was in great pain as he walked wriggling his body towards my room. I walked up and took him to the guest room where I got him a proper chair so that he could sit with some ease. My mind was in revolt. A young man with a good future and the ambition to become a politician was in a shambles. I hid my tears and tried to compose myself with words of courage for him. Jahirul is smiling and going around getting his visa to the US, which has the only treatment for the rarest of rare disease called Facloscapulohumeral Muscular Dystrophy. I did a story to help him get his sought-after visa —- “US visa costlier than life?” However, that failed to impress the consular wing and refused his visa to knowingly allow this young man to die a slow death. 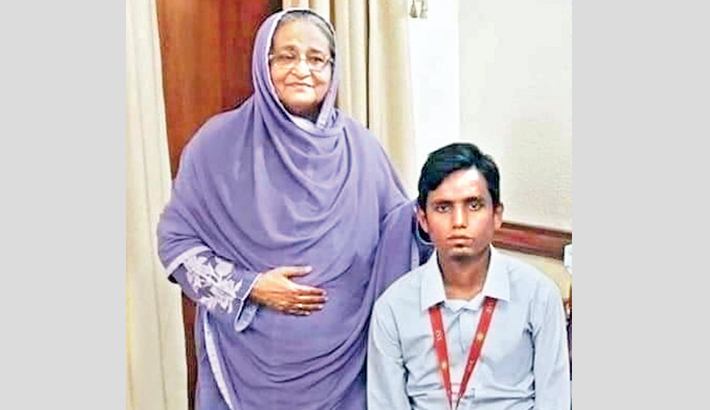 We both had tried and on 21 March 2019, Jahirul succeeded in his getting his most important and cherished dream to become an unforgettable reality – see the Prime Minister at her official Ganabhaban residence. But that was not all. Jahirul asked his “mother-like” Apa if he could take a photograph with her and started to get up with difficulty. “No, no, you sit down. I am coming,” he quoted the premier as saying adding that to his utter disbelief his leader asked the photographer to click as she stood beside him. True. Incredible and unbelievable! I cannot think of a second example of what Jahirul experienced. We can hope and pray that Jahirul will get cured and have got a new lease of life with the blessings and love of Prime Minister Sheikh Hasina. I would like to recollect the recent meet between the Prime Minister and main guest, again at Ganabahabnn, the new Dhaka University Central Students’ Union (DUCSU) Vice President Nurul Islam who was overwhelmed with his host’s motherly affection. “I lost my mother at the age of two and half. After losing her, I saw my mother’s image in one of my school teachers during my childhood and now I have found it in the Prime Minister,” he said, in his speech at Ganabhaban. Thus a man, elected from a different platform, was overwhelmed by the premier’s affection of “mother-like Apa” and he promised to be with her. I am just hoping Nurul keeps his word in entirety and thank him for taking charge as the DUCSU VP. These two incidents linked to the premier’s affection, love and charisma remind me of two other interesting examples of her great powers to make opposing people her friends. Retired army chief Lt. Gen. M. Mahbubur Rahman told me of his experience with the prime minister when he became her first army chief in 1996. That was also the first time Sheikh Hasina came to power getting her father’s Awami League back to power after 21 years, a feat that caught everyone by surprise as there were conspiracies to stop her from becoming the prime minister. “As a courtesy, I told my new boss (Sheikh Hasina) that I am ready to leave and she can choose a new chief. In turn, she asked – are you having any problem working with me? I have no problem and you should complete your term.” The General mentions this often and unlike many other leaders of the Bangladesh Opposition Party (BNP) he calls “Bangabandhu” as Bangabandhu and says he was unquestionably the undisputed leader of all times for the Bengalis, while his respect for the Prime Minister has made an eternal mark. The penultimate person is about my former colleague in Agence France-Presse (AFP) and a Pakistani national named Quatrina Hossain. On her arrival to back the Dhaka AFP bureau in the 1996 elections, she was chatting away about the “beautiful” BNP leader Khaleda Zia who became a Prime Minister from a just a house wife. She was briefed in Pakistan and on arrival in Dhaka by a few that Bangladesh’s only leader is Khaleda Zia. I asked her what she knew about Sheikh Hasina. Quatrina did not have much to talk about Bangabandhu’s daughter and I told her that she should meet the Awami League chief before starting to report from Dhaka. I approached the then opposition leader Sheikh Hasina to give time for Quatrina to meet and interview her. She agreed, but getting a time for this interview was difficult as Sheikh Hasina was on the campaign trail, including her famous “Whistle stop Joy Bangla campaign” during which I accompanied her. I informed Sheikh Hasina about a time before she left for campaign that would take her to Haluaghat in Mymensingh. She agreed, but myself and Ms. Hussain were late, and the Awami League leader was about to leave. “You are late,” Sheikh Hasina told me at her private Shudha Sadan residence in Dhanmondi. I had no answer, but quietly apologising to her. “Do you want to go with me on the campaign and we can talk during the journey,” the Awami League leader told Quatrina, who joined for the long journey to Haluaghat leaving me behind. That night I found Ms. Hussain seeing Bangladesh’s politics differently, realising she was wrongly briefed in Karachi. “Nadeem, she is just awesome. We have become friends and have exchanged our emails,” Quatrina told me in an excited voice. Ms. Hussain concluded, “I have found a friend in an incredibly warm sister-like leader and I will never forget her.” Sometime later when we both had left AFP, she told me she was in touch with Bangladesh’s new Prime Minister Sheikh Hasina. By showing respect to other, the Prime Minister has earned more respect and unconditional love over the years. I have met her many times as a journalist, including being the first reporter after the 2001 elections, but more importantly on personal levels. “Your mother was a great person. Do not worry, I am there,” she told me in 1999 after I lost my mother, whom she knew as a leader of Ghatok Dalal Nirmul Committee. From then on, she became my “mother-like Apa” (sister) and she surprised me by gifting a job in the Bangladesh High Commission, London. “Do not thank me. Just do your job seriously,” the Prime Minister told me in 2014 as she blessed me like a mother. In 2017, on return home I told Prime Minister Sheikh Hasina that I had a small gift for her which I brought with my first month’s salary in London. She did not want to accept it, but when I told her that “in the absence of my mother who else can I give this.” “Ah! You say things and I cannot refuse,” my mother-like premier said as she accepted my gift along with two of my books. What a delight for me, an orphan. There are many more instances of this great leader, a great sister and a great mother surely where her charisma has turned many of her enemies her friends and for many she is a “mother-like Apa” or simply our guardian. All those sane people who had come across her have wished her continued success and a long life. The writer is the Consulting Editor of daily sun.